Yusaku Maezawa is a Japanese entrepreneur and art collector. If all goes according to plan, Maezawa will take a lunar voyage on the Big Falcon Rocket, or BFR: a launch system that SpaceX is developing to colonise Mars. The mission won't land on the surface of the moon but will ferry Maezawa and his artist crewmates around Earth's natural satellite. Elon Musk and his rocket company, SpaceX, have revealed who will fly their spaceship around the moon for the first time: a Japanese entrepreneur and billionaire named Yusaku Maezawa. "Finally I can tell you that I choose to go to the moon!" Maezawa said during an announcement on Monday evening. 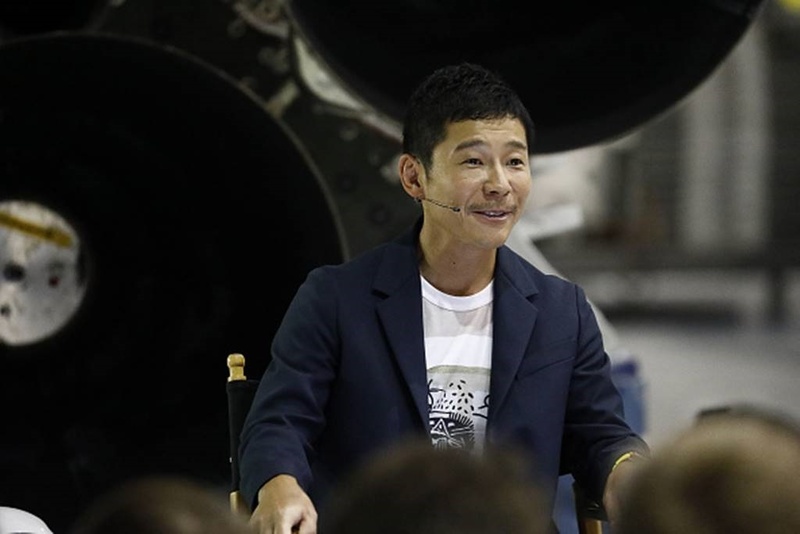 Maezawa revealed that he has purchased all seats on the first crewed flight of SpaceX's Big Falcon Rocket — a new launch system that's being designed to colonise Mars. Besides himself, Maezawa plans to select six to eight artists to accompany him on his journey around the moon. The artists have not yet been chosen, but part of the project will involve them creating work inspired by their lunar journey after they return to Earth. "If you should hear from me, please say yes and accept my invitation. Please don’t say no," Maezawa said. "He's paying a lot of money that would help with the ship and its booster," Musk said on Monday. "He's ultimately paying for the average citizen to travel to other planets." Maezawa was a skateboarder and drummer in his youth, and founded the custom fashion company Zozo 20 years ago. The billionaire has made a name for himself as an art collector. Last year, he spent $110 million on a 1982 painting by Jean-Michel Basquiat. He said that he was inspired to bring a group of renowned artists with him around the moon after thinking of the art Basquiat might have created had he flown through space. "One day when I was staring at his painting, I thought, 'What if Basquiat had gone to space and had seen the moon — what wonderful masterpiece would he have created?" Maezawa said. 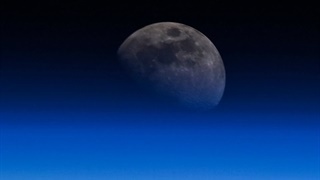 If all goes according to plan, Maezawa and his artist crew may become the first-ever private lunar tourists in history. The billionaire said he hopes the group will include a musician, sculptor, painter, film director, dancer, photographer, architect, novelist, and fashion designer. He is calling the project #dearMoon. The mission is slated to launch as soon as 2023, though Musk said he can't be sure about that timeline yet. "If I had some sort of crystal ball, I’d love to know how long things will take. You have to set some kind of date that’s the 'things go right' date. Then of course we have reality, and things do not go right in reality. Usually there are many setbacks and issues," Musk said. He added: "It’s not 100% certain that we succeed in getting this to flight ... But we’re going to do everything humanly possible to bring it to flight as fast as we can and as safely as we can." Musk described Maezawa as incredibly brave, and said his desire to participate in and pay for this trip restored Musk's faith in humanity. "This is going to be dangerous. This is no walk in the park," Musk said of the mission. 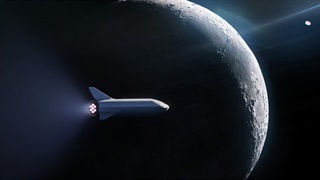 SpaceX's rendering of a Big Falcon Rocket spaceship carrying a passenger around the moon. Musk also revealed some major design changes to the BFR. Instead of standing 105 metres tall, it will be almost 118 metres tall. It will have front actuator fins, as well as three back wings that will function as its landing pads. The system's spaceship, which will ride atop a rocket booster, is expected to carry up to 100 people and 150 tons of supplies. SpaceX is currently prototyping the spaceship and other BFR hardware inside a 1,858 square metres tent at the Port of Los Angeles — at least until a much bigger permanent facility is completed. The first portion of the system has already been built, Musk said. "It's hard to say what the development cost is," he said. 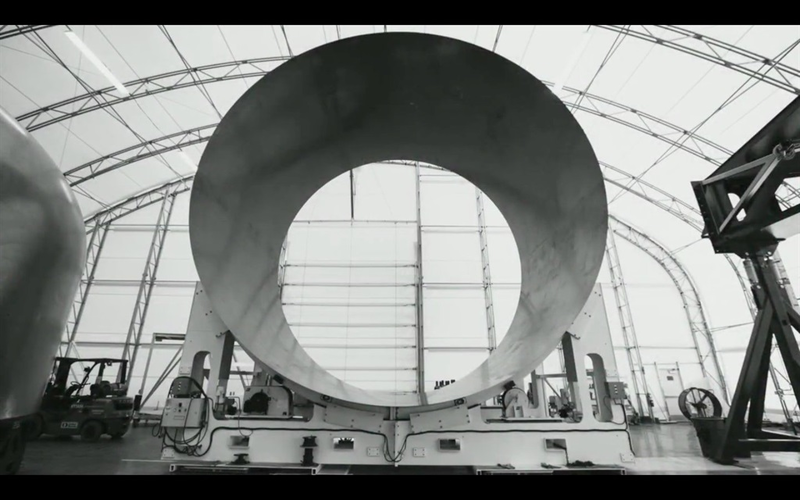 "I think it's roughly $5 billion"
A carbon-fiber barrel section for the Big Falcon Rocket. Prior to Monday's announcement, Musk last publicly described the BFR and showed renderings of the system at the 2017 International Aeronautical Congress. Although the design for the exterior has been altered since then, Musk said on Monday that SpaceX still only has "some concepts" for the interior of the ship. "What is the most fun you can have in zero G?" Musk said when Business Insider asked about the interior design. 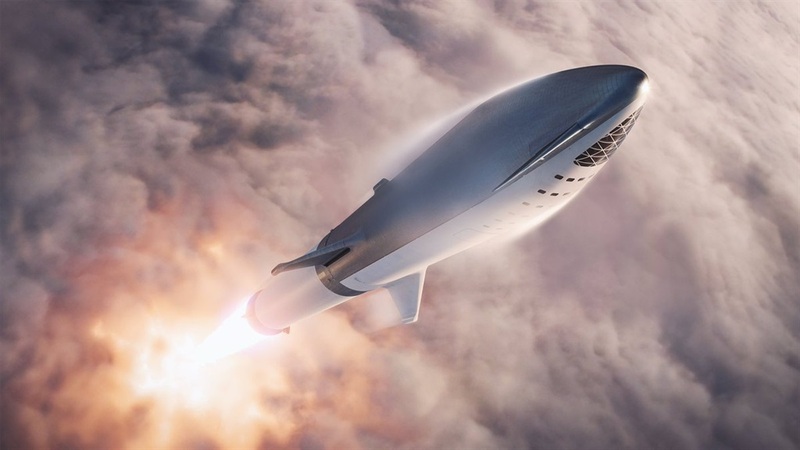 "We'll do that"
Aerospace experts who follow Musk and SpaceX's activities suggest that there could likely be more iterations of the BFR design before the company's first lunar voyage lifts off the launch pad. “I think it is really healthy to see this iterative change happening, because I believe we can assume it is based on actual development and simulation going on,” Greg Autry, the director of the Southern California Spaceflight Initiative, told Business Insider in an email before Musk's announcement. But Musk said "this is the final iteration in terms of broad architectural design." A Sept. 2018 rendering of SpaceX's Big Falcon Rocket launching through the cloud tops and toward space. 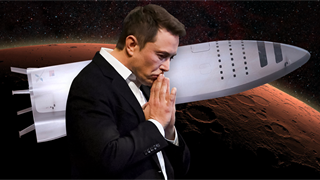 He added that SpaceX plans to shift a majority of the company's engineering efforts towards BFR by the end of next year, and welcomes the growing competition in the private space race. "Why is it 2018 and there's no damn base on the moon?" Musk said. "We should have one and go there. A lot."